And this is why I’ve gotten next to nothing accomplished today. How can I disturb this? 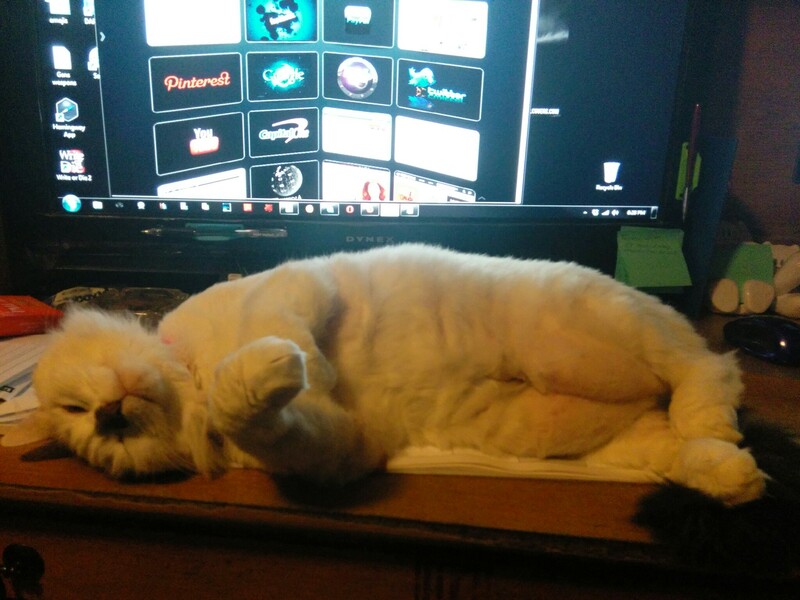 This adorable lil wench taking up all my space. Seriously, I got nothing done today. I will admit to being in some pain today and broke down and took my hydrocodone. It leaves me pretty listless and useless. I need to work on this weeks Spotlights. Tomorrow is shopping day. Oh. Joy. Sam’s Club, Wal-Mart, Publix for groceries. Ick. All those people. However, I’m getting up early to do it all to hopefully avoid the bulk of the masses. I need two new tires and brakes for my beast of a truck, and that will leave me without a vehicle for the weekend. Boo. I’m well stocked on coffee and sweetened condensed milk though. I’ll survive. This entry was posted on Friday, February 6th, 2015 at 2:03 am	and tagged with writing and posted in Blogging, Cats, Guest, I went Bump, My novel, Spotlight. You can follow any responses to this entry through the RSS 2.0 feed. I’m not a cat person, but I may have just made some rather unmanly noises…. Potentially odd, and not directly related, but what’s that on your screen? Some form of social media desktop all-in-one? Reminds me of Steam’s “big picture” mode. Random, I know, but I’m always curious about the software other writers are using. Its called ‘Speed Dial’. Its just a browser extension I use for both my Chrome and Firefox browsers. It takes a little pic of the Sites main page and you just click it to go there once saved. Its easier than dealing with ‘Favorites’ folders and whatnot, and visually appealing. You can also separate things into categories too. Its very nifty, I’ve been using it for years. If you work from both a desktop and laptop like I do, you can get another extension that will keep them synced for convenience. Never forget a site! Its great for saving articles you want to read later, too! Hmm. Might have to check that out. Thanks!